August kicked off with a weekend safari to Lake Bogoria. 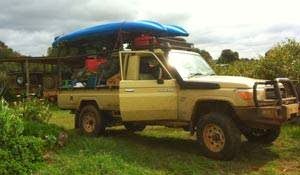 We loaded up the trusty Landcrusier with sundry camping gear and ample sustenance. As the crow flies, Bogoria is only about 50km from Ekorian’sMugie Camp but the winding roads led us on a merry dance reminding us why most of our guests choose to fly into one of the two local airstrips. We reached the lake and soon found ourselves battling the aftermath of very heavy rainfall. The tracks through the park were submerged and any attempt at forward progress was a gamble. A stuck and semi-submerged motorbike up ahead proved insufficient deterrent and we promptly joined the floundering motorcyclist. Our wheels continued turning but our car ceased moving. Water filled the cabin to waist-depth. Distressingly, this wasn’t plain, harmless rainwater, this was sulphurous “soda water” from the volcanic geysers in the lake. The smell of sulphur and dead flamingo (which bobbed unhappily and upside down nearby) was quite overwhelming and the girls battled with this while the boys splashed around in the corrosive brown water, battling ineffectually with rocks and shovels. Finally a Range Rover came to the rescue and we were pulled out a little after 10.30pm. We’d wallowed in this skin-burning water for several hours and there was many a sore to show for our troubles. A welcoming bottle of whisky back at camp went some way to compensate…until our early start the following morning that is! Up at Mugie we have been closely following the progress of our lion cubs who are now becoming quite the playful, curious gang of five. We’ve been treated to many a display of their play-fighting and kitten-like toying with their mothers’ tails. We are very lucky that the mature members of the pride don’t see us as a threat and allow us to sit less than ten meters away and watch. A couple of the cubs even fumble right up to the car and take a good long look at us…until one of its siblings pounces and they both roll over in a grappling ball. Our helping Brit Henry was joined by an itinerant Brit called Charlie who dropped in to lend a hand for a couple of weeks. He was new to the ways of Kenyan safari life and was evidently charmed by the close proximity to so many interesting animals. At Ekorian’s Mugie Camp we often hear lions calling close at hand as they pad down the track at night. The trumpeting elephant and even a skulking leopard made themselves heard during his stay. His wide-eyed outsider’s awe gave us a fresh perspective on how lucky we are to have all these animals to ourselves and safely protected by the sanctuary’s fences and guards. This month it seemed that all the wildlife at Mugie was feeling broody. The breeding herds of the various antelope species were always closely followed by competitively-rutting bachelor herds looking to win a harem. Countless knock-kneed zebra tottered along after their mothers and we occasionally glimpsed a week-old elephant protectively surrounded by the rest of its herd. The burgeoning populations of all our animals bode well for the future of our little camp and of Kenyan safaris and wildlife in general.